Residual urine volume is usually determined by means of a bladder scan after voiding; it may be measured directly by means of catheterization if bladder scanning is not available. Residual urine volume reflects bladder and outlet activity during the emptying phase of micturition. Up to 100 mL of postvoid residual urine with a voiding frequency greater than every 2 hours is acceptable if the patient is not experiencing frequent urinary tract infections. Ultrasonography is used for the routine assessment of the upper urinary tract. Additionally, it may be used to identify the presence of ureteral obstruction, scarring, masses, and either renal or bladder calculi. 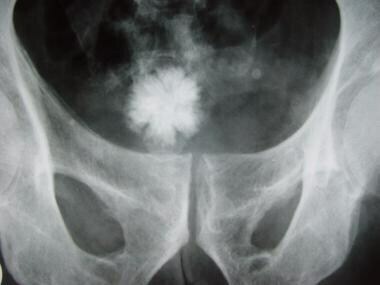 Plain radiography of the urinary tract, bladder, and kidneys is used in conjunction with ultrasonography to determine the presence of radiopaque calculi (see the image below). Excretory urography or intravenous pyelography (IVP) may be used for visualization of the collecting system. Isotope studies (eg, technetium-99m dimercaptosuccinic acid [DMSA]) are used for evaluation of renal cortex function. The determination and record of bladder volumes and pressures: The normal adult bladder can contain 400-750 mL of urine, with a maximum bladder pressure of 15 cm water. Abnormal findings include decreased bladder compliance with intravesical pressures exceeding 15 cm water and a steep rising curve in the cystometrogram, possibly due to bladder inflammation, bladder fibrosis, or detrusor hypertrophy. A noncompliant bladder with reduced capacity demonstrates a steep curve associated with neurogenic lesions, inflammation, or severe outlet obstruction. Assesses the leak point (ie, the pressure at which voiding occurs): A leak point in excess of 40 cm water may result in hydronephrosis in children with myelomeningocele. Electromyography (EMG) is used to diagnose the mechanistic cause of urinary retention and incontinence by measuring electrical potentials generated by depolarization of the detrusor muscle and the urethral sphincter. Anticipated normal findings include an incremental increase in EMG activity in the external sphincter during the filling phase secondary to increased recruitment of motor units. Before voiding, diminished EMG activity in the external sphincter is expected. Relaxation of the external sphincter is followed by bladder contraction. Abnormal EMG patterns consistent with incontinence include absence of recruitment and low levels of EMG activity, as in patients with complete SCI. An inappropriate increase in EMG activity of the sphincter may be observed in patients with urinary retention, leading to detrusor contraction against a closed sphincter or detrusor-sphincter dyssynergia. Potential findings include confirmation of detrusor-sphincter contraction dyssynergia, increased duration of bladder contractions, and uninhibited bladder contractions. Cystoscopy is indicated in patients with recurrent urinary tract infections, especially those with bladder stones. It is also indicated for investigating the possibility of tumor or assessing trauma. Finally, it is useful for evaluation of the bladder outlet and urethra. Evaluation of complex lower urinary tract pathology is performed by using videourodynamics. This technique involves EMG studies during 3 phases, in conjunction with periodic screening of synchronous cystourethrographic studies of the bladder and outlet. Videourodynamics is particularly useful for the detection of sites of bladder outlet obstruction and detrusor-sphincter dyssynergia.